I wondered why 13 was closed on Monday, and unfortunately it was an accident at the Ringwood Road intersection. Yesterday there was another crash, this time between a car and a tractor-trailer. Be careful out there! Update: Alas, yesterday's accident was fatal. Update again: Worse, fatal to both people in the car. In brighter Dryden news, Cathy Wakeman marvels at the many organizations that make Dryden a great place to live. She then notes the Sertoma spaghetti dinner and S.A.N.E. silent auction on the 15th, the Varna breakfast buffet on the 10th, and the Chili Cook-Off and Apple Pie Contest at the Dryden Community Center Cafe on the 16th. If you want to vote in November, you need to register by Friday. Two stories take a look at what's likely going to be a long waterfall of the state dumping responsibilities to local government while pretending to do something about taxes. The first is about local government probably having to take over work on the Black Diamond Trail (on the other side of the county) because the state just doesn't have the resources. The second is on the County Legislature opposing a property tax cap in an age of ever-increasing state mandates. Something's going to break here in the next few years. Dryden Middle School was very busy last night, with firefighters battling a blaze in the boiler room, where mechanical equipment seems a likely cause. The Dryden Fire Department will be having an open house Sunday with a demonstration of the effectiveness of sprinklers, as well as a variety of related emergency services demonstrations and tours. Tompkins County Historian Carol Kammen has a moving piece about Julia Cook, a Dryden resident and Civil War nurse. It's a sad story of loss with a beautiful moment of volunteerism, followed by a long sad sunset. They're creating a scholarship in her name for nursing students at TC3, who I hope will enjoy her inspiration. Looking beyond the town line, work finished on a $460,000 project to stabilize Six Mile Creek's segment in Caroline. The Town of Ithaca is looking at some stark tax increases, and candidates for state legislature held a debate. The Dryden Town Board will be discussing the zoning proposal this Wednesday at 8:00pm at Dryden Town Hall. They'll be holding their regular meeting to set the agenda for the October 13th meeting from 7:00pm to 8:00pm, then switching gears. I hope they operate at a slightly deeper level than last month's slow polishing, and that more people show up to listen (or speak at the end) - we'll see! Yes, the Dryden High School/Middle School will be open as usual tomorrow. The Journal also reports on the Dryden Fire Department's sprinkler demonstration yesterday. The 24th Congressional District race gets a look from media that don't usually notice us. The 912 Taxed Enough Already of Cortland and Tompkins County group will be sponsoring a ReValue America event Wednesday October 13th from 6:00pm to 9:00pm at the fire station. Pre-registration is required. The Dryden Grange and League of Women Voters will be holding a Meet the Candidates event there Thursday, October 21st. The sign didn't say which candidates, but I'll post more as soon as I have news. The Town Board tackled zoning again last night. I'm happy to report that more people were there to watch - six of us plus a WHCU reporter. We all strained to hear, I'm afraid, but fortunately the board distributed copies of the notes they were working from, based on their previous meeting. Councilman David Makar suggested changing the language of that clause to make it positive, stating that uses which are listed are permitted, and dropping the "prohibited" language. Supervisor Mary Ann Sumner encouraged the idea, but Town Attorney Mahlon Perkins explained that it would allow anyone with a use they could define outside of that table to do it anywhere. New York State law generally gives property owners the benefit of the doubt unless municipalities explicitly close the door to such possibilities. One other piece that spun out of that discussion was Environmental Planner Dan Kwasnowski asking whether another residential zone - neighborhood residential - might be a better place to put the more restrictive zoning, while allowing "rural residential" to feel more openly rural. I spoke in favor of that idea, as it just doesn't make any sense to me to apply zoning that feels like it was written for Ellis Hollow to large portions of the Town. The other subject that got extensive discussion was mining, especially gravel pits. This is complicated because the state issues permits for mines removing more than 750 cubic yards, while the Town issues permits for smaller ones. The state won't grant permits that violate Town zoning, however. There were questions about whether it made sense to limit mining by zoning district or by something more like a minimum lot size with setbacks from environmentally sensitive areas. Group homes of various kinds got a look, and the Board opted to remove much of the language from the Congregate Care Facility and Senior Home definitions which limited those uses to older residents. Also, the site evaluation criteria for Elder Cottages were combined with those on accessory apartments, and the conversation about cabins was intriguing. They have to be owner-occupied, but don't have to have electricity or plumbing. However, heat must be from renewable sources - no coal stoves or propane. There was also an issue with multi-unit developments built on the same lot in multiple phases with financing from different lenders. Despite some question as to whether this was properly a zoning issue, it seemed clear that this was at least a potentially destructive situation. This meeting felt a little more together than the previous one, though I suspect a lot of that is helped by building on the previous conversation. I still didn't have much sense that the Board could get through this quickly, but I guess we'll see what happens. I worry that they're still polishing when they should step back a little and look at the zones, but at least they stepped way way back and considered what Section 500 was about. We'll see. Alexis Javier Cirino-Rodriguez, 20, "became unresponsive after a physical incident involving intervention by the staff from the facility" around 7:18 p.m., according to an announcement by state police officials. Agency staff began CPR, which was continued by Dryden Ambulance personnel, the officials added. Cirino-Rodriguez was taken to Cortland Regional Medical Center where he was pronounced dead. Autopsy results are pending, officials said. In a brief statement, agency officials said they're conducting an internal investigation and that "further information will be released as it becomes available." Stimulus funds are definitely flowing in Dryden, as the foundation for the new Village of Dryden wastewater treatment plant was poured Wednesday. 55% of the $7.3 million cost is covered by federal and state grants, with a low-interest federal loan covering the rest. In lighter news, TC3 professor Chris Xaver will have a cooking show on PBS this spring. Saturday was a busy morning at the Dryden Community Center Cafe, with music, apple pie, chili, and the dedication of a new accessibility ramp and deck built by volunteers. 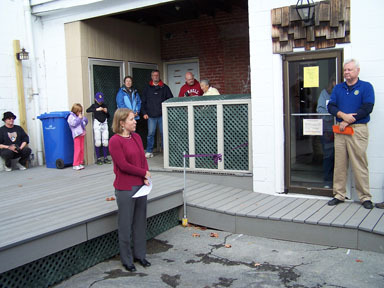 Cafe board president Beth Peck speaks about the ramp. 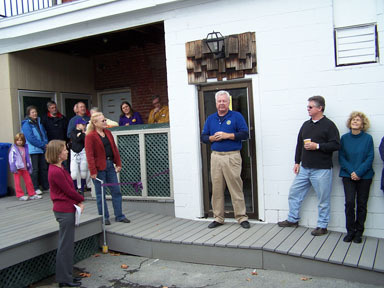 Rotarian Brian Buttner describes construction and future plans. 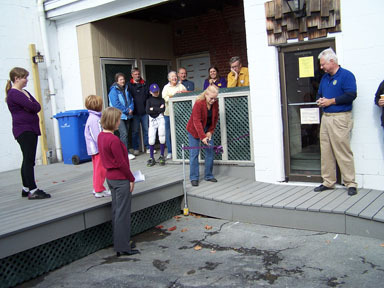 Town Supervisor Mary Ann Sumner cuts the ribbon to open the ramp. Yes, they will be adding railing to both the ramp and the deck. The next phase of the project will make the bathrooms accessible as well. 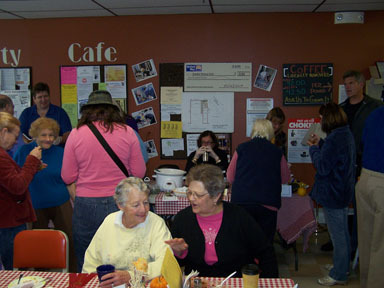 Inside the cafe, the 3rd annual Apple Pie and Chili Contest was in full swing. I was delighted to be one of the apple pie judges, with Elsie Gutchess, Brian Buttner, and Monica Armstrong. The first choice standout turned out to belong to none other than the Cafe's President, Beth Peck, but while first and second were clear, third place was a difficult choice. I enjoyed the chilis too, but don't yet know who won! It's been a few years since there were horse-drawn wagon tours in the Village of Dryden - this should be great! The tour runs continuously from 1 to 3pm, and will pick up passengers at the corner of James and Union Streets in front of Dryden Elementary School. Bring the whole family and learn more about Dryden's history and architecture while experiencing a leisurely wagon ride through the heart of our town. This event is free and open to all. In case of light rain, bring a raincoat and umbrellas. The ride will be cancelled in heavy rain. If it snows, we go! For more information, visit www.historicithaca.org. I wrote about Cayuga Pure Organics a few years ago in the context of their having local wheat, but now they've expanded their market to New York City and especially restaurants. I think this local food thing is catching on, though I'm surprised that NYC has to go this far. I don't, but the Governor seems to want it that way over in Greene County. This is an awful precedent, and I hope it doesn't stand. No, it's not exactly a Dryden story, but it's not too hard to imagine plausible scenarios for similar problems in Tompkins County. Want to help Dryden reduce its energy consumption? Come to Town Hall (93 East Main Street / Route 392) this Saturday at 11:00am, and help out! "There will be a short training and people will go out in pairs with a route map." New York State's largest-ever rural delivery of energy-saving light bulbs is preparing to deliver money-saving treats to residents on the eve of Halloween. On Saturday, October 30, "Lighten Up Tompkins!" will mobilize 400 community volunteers and Into-the-Streets students from Cornell University to deliver energy efficiency educational materials, products, and coupons to 5,000 homes across Tompkins County -- just in time for the winter winds. Bags include a compact-fluorescent light bulb (CFL), information about programs to upgrade energy systems of homes, coupons from local businesses, and a raffle-entry form qualifying for $2000 worth of prizes. If each household installs their CFL, $278,000 will be saved collectively as well as 3.46 million pounds of carbon dioxide emissions avoided over the life of the bulb. As the Journal reported, Dryden High School students helped stuff the bags earlier this week. Republican Congressional candidate Richard Hanna and Assembly candidate Tom Reynolds were at Clark's yesterday too, the Journal reports.